With the death of US Senator John McCain, Albanians lost a great friend who fought to the end for independence and freedom of Kosovo. Representatives of politics in Kosovo expressed today condolences for the death of the US Senator John McCain. Prime Minister Ramush Haradinaj expressed sadness at the news of the death of US Republican Senator John McCain. "The family lost its member, America's hero, and Kosovo a precious friend, without whom our journey towards freedom and state-creation would be more difficult. Winner in war and peace, great fighter for human rights and lawless peerless. He entered our hearts as a humanist and will have a place of honor in the state memory of Kosovo. Farewel Kosovo's friend, John McCain. Rest in peace," Haradinaj said. Speaker of Parliament, Kadri Veseli, said that he was a great friend of our freedom and independence. "Last year at the Kosovo Assembly we had the honor to expect Senator John McCain, the great friend of our freedom and independence. I keep memorable special impressions from meeting with him. A brilliant mind that, with a few phrases, disaggregated even the most complex problems of our time. Kosovo has been blessed with having friends like Senator McCain. His death has afflicted us all. Be in peace, our great, unforgettable friend," Veseli wrote. The Chairman of the Social Democratic Initiative at the same time deputy prime minister in Kosovo's Government, Fatmir Limaj, also expressed his regret for the news of the death of the great friend John McCain. According to Limaj, the citizens of Kosovo will never forget the contribution of Senator McCain who provided support to Kosovo at the most important moments for our country. "McCan, with his commitment and strong attitudes from a statesman, from a war hero turned into a political icon in the US. Limaj was said to be a great friend of Albanians in peace", Limaj said. Kosovo Democratic League Chairman Isa Mustafa considered a great loss for Kosovo the death of Senator John McCain. "He was a great friend of our country and people, whose absence will be felt a lot, especially in the difficult times we are being warned. John McCain will always be reminded by Kosovo and its citizens. God bless Senator John McCain's invincible spirit," he said. 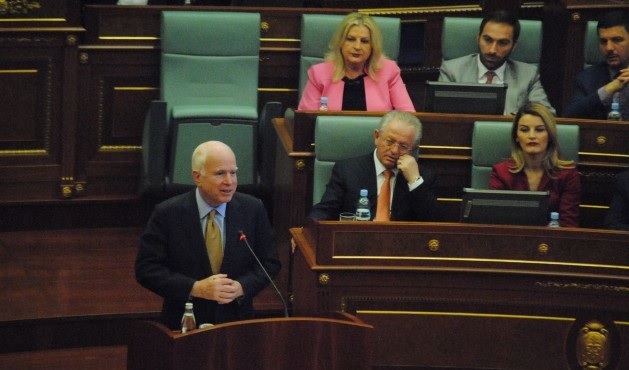 Deputy Prime Minister Behgjet Pacolli said that Senator McCain, apart from the US hero, was and will remain a hero for Kosovo.